Born on April 13, Samuel Beckett (1906-1989) was the 1969 recipient of the Nobel Prize for Literature. The author of 22 dramatic works, six collections of poetry and numerous other novels, novellas and biographies he is best remembered for the play where nothing seemingly takes place — Waiting for Godot. Described alternately as absurdist or existentialist, Waiting for Godot was originally written in French as En attendant Godot and published in 1952. Translated by Beckett himself, the English version of the play premiered in London in 1955. In English, the play downplayed the biographical details of the main characters — Vladimir and Estragon — while adding more gravitas to the concept of memory and memory loss. In the play, Vladimir and Estragon converse not just to pass the time, but to avoid the silence that envelops them throughout. Vladimir: What do they say? Estragon: They talk about their lives. Vladimir: To have lived is not enough for them. Estragon: They have to talk about it. Vladimir: To be dead is not enough for them. Estragon: It is not sufficient. The passage that is enshrined on Library Walk projects the protagonists view that life is empty...death is empty and that the best course of action according to Estragon earlier in Waiting for Godot is to do neither. 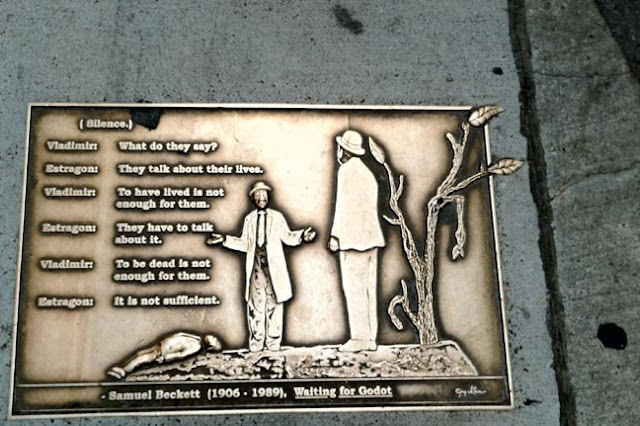 Samuel Beckett always insisted that Godot was not God. Whether it be a birth day, anniversary or publication date of a seminal work, the Bar None Group will revisit these 40+ quotations from time to time — quotations that inspire one to write, read, explore and embrace literature. We last visited Henry Wadsworth Longfellow.